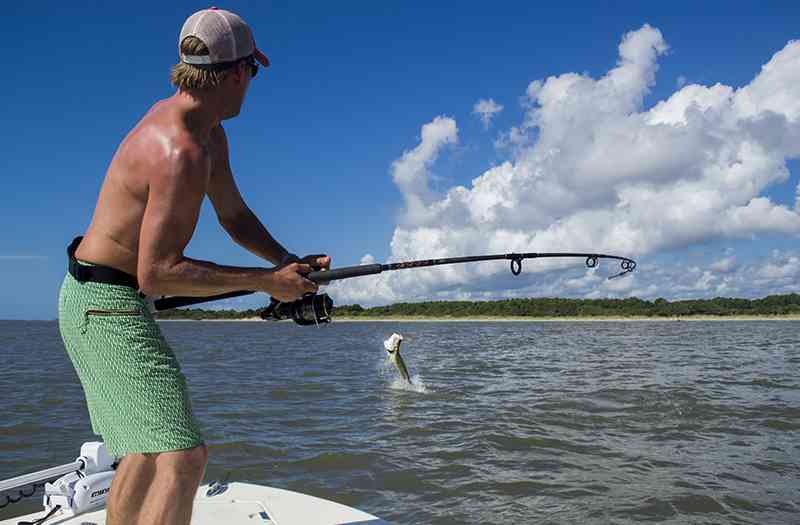 Catching a Tarpon is perhaps the pinnacle of inshore fishing in Coastal South Carolina. Tarpon fishing is the ultimate challenge for any angler and the Myrtle Beach area is blessed to have some world class tarpon fishing just a few miles to the south. Tarpon that migrate to South Carolina have a reputation for being some of the strongest fighting fish in the ocean, displaying acrobatics that no other fish of it’s size can match. These fish average 80-120lbs, and it’s not uncommon to come across tarpon that push the 150lb mark. Where do you fish for Tarpon? Perhaps the largest concentration of Tarpon in South Carolina can be found about 20 miles south of Myrtle Beach. 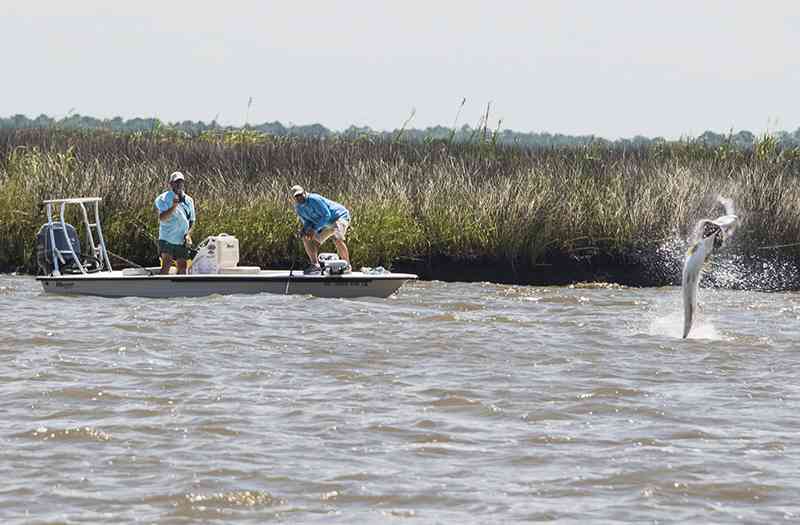 Winyah Bay, Santee Delta, and Cape Romain are areas with very little development and minimal boat traffic which is conducive for excellent tarpon fishing. Tarpon will congregate along the beaches just beyond the breakers, near jetties and inlets, and will often travel miles upriver following baitfish. With such a wide playing field, it is critical to have local knowledge and good understanding of their tidal migration patterns. When to fish for Tarpon? Tarpon will begin showing up in Myrtle Beach around the last part of May when the menhaden(bait fish) begin to show up. From there, tarpon fishing get’s better thru the Summer months, peaks in Aug and Sept before migrating back south in mid October. The Fall Mullet Run typically signals the peak of tarpon fishing in South Carolina which typically starts in mid August. Due to the size and fighting ability of Tarpon, anglers should be prepared to do some serious battle since fights will often last over 30 mins (depending on the angler and the fish). We target tarpon using a variety of methods including drifting live bait, cast artificial lures, and fly fishing for tarpon. Experience is a bonus but not required. A good set of sea legs is also a bonus when we are fishing larger bodies of water or in choppy seas. Tarpon are strictly catch and release only. Since they have no edible value, there is no need to kill a fish of this caliber. We do work with Gray’s Taxidermy Gray Taxidermy who can do a replica of your fish should you decide to get a mount.